Tailored advice to show you what you need to do to meet your legal responsibilities for health and safety. These FAQs have been categorized into manufacturer or suppliers and users of pressure systems. PED is a European Single Market Directive that covers pressure equipment and assemblies with a maximum allowable pressure PS >0.5 bar. PED was adopted on 29 May and came into force on 29 November 1999. Pressure equipment means vessels, piping, safety accessories and pressure accessories. Assemblies are defined as several pieces of pressure equipment assembled to form an integrated, functional whole. The principal intention of the legislation is to enable the free trading of products within the European Economic Area by removing the need for separate documentation and testing for each individual European market. Manufacturers may use a single CE mark on their products to show compliance with this (and any other relevant) Directive. The Directive does not deal with in-use requirements that may be necessary to ensure the continued safe use of pressure equipment. This is dealt with in Britain by the Pressure Systems Safety Regulations 2000 (PSSR). The Directive covers a wide range of equipment such as reaction vessels, pressurised storage containers, heat exchangers, shell and water tube boilers, industrial pipework, safety devices and pressure accessories. Such equipment is widely used in the chemical, petrochemical, biochemical, food processing, refrigeration and energy industries and for power generation. The Directive has been implemented in the UK by PER 1999 (SI 1999/2001) which came into force on 29 November 1999. The Regulations were amended by the Pressure Equipment (Amendment) Regulations 2002 (SI 2002 No 1267), which came into force on 30 May 2002. A list of Conformity Assessment Bodies accredited under PED can be found by following the appropriate links on the BIS website. The Health and Safety Executive (HSE) and local authorities have responsibility for the enforcement of the UK Regulations (PER 1999). I am a UK-based manufacturer of pressure vessels containing toxic gases. Which pressure-related legislation applies to me? Toxic gases are a Group 1 fluid as defined in the Pressure Equipment Regulations 1999 (PER). These are the relevant regulations as they deal with the design, manufacture and supply of pressure equipment. However, there are some exceptions and pressure limitations that may mean that PER does not apply. BIS guidance will provide additional information. I manufacture boilers of x bar.litres. Which pressure legislation applies? Any pressure equipment containing a fluid in excess of 0.5 bar above normal atmospheric pressure is subject to PER (unless specifically excluded, see PER regulation 4 and Schedule 1). The guidance document provided by BIS has a very useful flow chart at Annex C. This shows how to classify the equipment depending on both what it is designed to contain and its operating pressure. It also indicates the conformity assessment procedure (CAP) that must be followed before placing the equipment on the market. This CAP may involve the appointment of a notified body who will issue a certificate of conformity once the appropriate tests have been successfully carried out. I am a manufacturer supplying several pieces of pressure equipment that the user intends to put together on their own site to form an installation. Does PER apply? What is meant by 'sound engineering practice' (SEP), the concept referred to in PER regulation 9, and referred to in several of the conformity assessment charts in the pressure equipment guidance notes? SEP is not defined within PER (or the Pressure Equipment Directive), but it is generally taken to mean the use of industry standards and practices that have been in use for many years and have demonstrated their safety over time. This does not mean you can't use novel or innovative design and manufacturing processes, provided that the processes are based on sound engineering principles, including adequate testing of all materials and processes. I am a manufacturer of pressure equipment. Which UK pressure-related legislation applies to my activity? The two principal pieces of legislation that could apply to the design, manufacture and supply of pressure equipment are the Simple Pressure Vessels (Safety) Regulations 1991 and the Pressure Equipment Regulations 1999 (PER). The correct regulations to comply with will depend on matters such as the fluid being pressurised, the size of the vessel in the system, and the pressure itself. I am a manufacturer. How can I comply with the essential safety requirements (ESR) of the Pressure Equipment Regulations? Produce a technical file that addresses each of the ESRs in turn. However, this can be long and complicated. Use harmonised standards (BS EN or ISO EN) that have been agreed by all member states. Only standards that have been listed on the Official Journal (OJ) with a reference to the Pressure Equipment Directive give a 'presumption of conformity' to the specific ESRs of that Directive. PER regulation 8 is about 'assemblies' but the definition in regulation 2 is not particularly clear. What is really meant by an 'assembly'? 'Assembly' is the name given to equipment that is formed by putting several pieces of pressure equipment together and selling it as an integrated and functional whole. There is no upper limit on the size of an assembly. Putting many pieces of pressure equipment together to form a complete system that is fixed on a site under the responsibility of the user should not be termed an assembly. It is more properly termed an industrial installation and falls outside the remit of PER (see regulation 4(2)). If the user/client puts together the assembly themselves it will not be CE marked or have a certificate of conformity. PER only applies if the assembly has been completed by the manufacturer or is being 'placed on the market'. However, it may be that items used to form an assembly may be CE marked if they were placed on the market as specific pieces of equipment. What is meant by the term 'placing on the market'? The Commission Guide states that 'placing on the market' means the initial action of making a product available on the Community market, for payment or free of charge, with a view to distribution and/or use in the Community. It takes place when the product first passes from the stage of manufacture to the stage of distribution and/or use. Since placing on the market refers only to the first time that the product is made available on the Community market, the directives apply only to new products manufactured in the EEA, and to new or used products imported for the first time from a third, ie non-EEA, country. I have several air conditioners in my factory. Does PSSR apply? It depends what you mean by 'air conditioner'. If it is just an air recirculation system that does not contain a pressure vessel then the answer would be no. However, some air conditioners are cooling systems that could contain a 'relevant fluid' (see PSSR regulation 2 for a definition of a 'relevant fluid'). If so, and the combination of pressure and vessel size is sufficient, then more Regulations of PSSR will apply. The PSSR Approved Code of Practice (ACOP) Safety of pressure systems (L122) has a very useful and easy-to-follow flow chart at Appendix 1 which will tell you (a) whether or not PSSR applies, and (b) which specific regulations are pertinent. A mobile system is one that can be easily moved from place to place, eg an air compressor that is taken from site to site. An installed system is one that is not a mobile system, eg a steam boiler. The legal responsibility for defining the scope of the WSE rests with the user/owner who may need to seek advice from other sources such as in-house engineering staff, inspection staff or consultants. The owner/user will appoint a competent person who will help draft a WSE, which will specify the nature and frequency of examinations (including any special measures needed to prepare the system for safe examination), and carry out the examination itself as required by regulation 9. Note: There is a clear duty on users/owners to ensure that the equipment is not operated beyond the date specified in the current examination report. Under PSSR, what is the role of the competent person (CP)? The CP will be appointed by the user/owner to help compile the Written Scheme of Examination (WSE) under PSSR regulation 8, and to carry out the resultant examination under regulation 9. 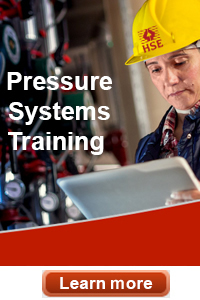 HSE has produced an Approved Code of Practice for PSSR Safety of pressure systems, and paragraphs 35 to 43 and 104 to 108 outline the role and attributes of the CP. Note that the term 'competent person' is not the individual employee but their employer and as such the legal duty to comply with PSSR rests with a competent person's employer, and not with the individual (unless that person is self-employed (see ACOP paragraph 17)). Does PSSR apply to my pressure system? HSE has drawn up, in consultation with stakeholders, an ACOP for PSSR Safety of pressure systems which is freely available as a download. Appendix 1 to the ACOP contains an easily understandable flow chart (or decision tree) that will help dutyholders decide which specific regulations apply to their pressure system. I am a user of a pressure system and have to draw up a written scheme of examination. What information needs to be included? every pipeline and pipework in which a defect might give rise to danger. The maximum interval allowed between examinations. Commercial coffee boilers incorporating a pressure vessel (e.g. cappucino makers) generate steam and therefore come under the requirements of PSSR. Regulation 8 requires the drafting and completion of a written scheme of examination (WSE), and regulation 9 requires that this examination be carried out by a competent person. Please see other FAQs for further details of the WSE, the examination in accordance with the written scheme, and the role and attributes of the competent person.